A few weeks ago, I put up a post that was secretly about the benefits of playing conservatively. This post is openly about doing the opposite. I’m not contradicting myself. I’m just giving you something else to think about. So you do, and take a Gentleman’s Bogey to the next tee, no happier, and still wondering if you should have tried that riskier shot. Yes, you should have. You’ll never know how good you are if you never take a challenge, or if you don’t learn how to take a challenge. And most of all, you’ll never have all the fun golf can provide. Not every shot is challenging. I’m talking about five or so shots per round. If you have the shot in your bag, accept the challenge. Play a full-sized game. Don’t go small every time. Say you’re 80 yards from the pin, but it’s tucked behind a bunker. If you have confidence in your pitching game, don’t chicken out toward the center of the green. Play right for the pin. That’s how you’re going to get your up and down. Regard the bunker as out of play. Forget about it. Play for down in two instead of guaranteeing down in three. Narrow driving hole? Out comes your fairway wood or some kind of hybrid iron. But if you have a little fade with your driver you can hit whenever you want to (and that’s not a hard shot to learn) go with the Big Dog. Yes, sometimes you won’t pull off the challenging shot and you’ll end up with a double bogey. So? There are seventeen other holes. Or you don’t want to play this way because bad rounds will raise your handicap. Well, the low scores you’ll shoot offset the occasional bad ones, and why do you even have a handicap anyway, when all you’re out there for is to have fun? It comes down to this. Don’t play stupid shots. But if you know you can do it, then do it. Stretch yourself. Step out of your rut. You become a better player by hitting shots better players hit. And you’ll have more fun. 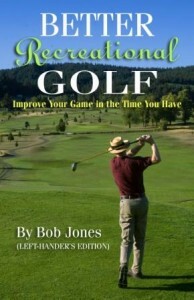 Regular readers know that one of the drums I beat is to have your hands leading the clubhead going into the ball. Let me give you two drills to help you learn how to do that. 1. Take your sand wedge and hit chips with only your left hand on the club. If you play left-handed, then it would be only your right hand on the club. If your habit is to bend your left wrist backward through impact, you’ll learn very quickly that you can’t hit a good shot when you chip like that with the left hand alone. You’ll have to keep your left wrist straight as you bring the club thorough the ball, and the easiest way to do that is for the left hand to lead the clubhead. There’s no need to take a very big backswing. Maybe take your hand back to hip height at most. Make it a slow swing. It’s a chip. No need to belt the ball. Your only concern is to get your left hand to the ball before the clubhead gets there. After a few months of practice that have led you to mastery of this drill, you’re ready for drill number two. 2. Hit 75-yard pitches, over and over. Hit a bucket of nothing but that shot each time you go to the range. As before, work on the feeling of your left hand getting to the ball before the clubhead does. You’re holding on with both hands now, but your mind is still on your what your left hand is doing. And don’t abandon drill number 1, either. Use it to warm up for drill number 2. Once you get really good at this drill, you are only inches away from making full swings in which your hands get to the ball before the clubhead does. Along the way, there’s the bonus of learning how to hit those longer pitch shots really well. Most recreational golfers I play with hit this shot poorly. You will also learn a few things about striking the ball on the center of the clubface, which never hurt anybody. Practice these two drills patiently until you have mastered them. I would give you a year of continual practice before these drills, working together, make the hands-first strike a normal part of your swing, instead of something you have to think about. When that transition has been made, look out! I want to ask you to try three different ways of playing golf. They come from a book titled, Golf Is a Very Simple Game, by Jonathan Fine. 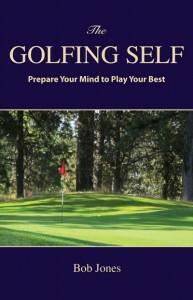 The book is a summary of the teachings of the golf teacher Francisco Lopez. 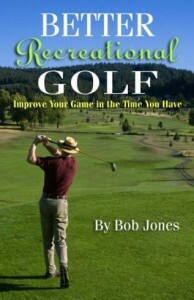 I recommend this book to you, and its companion volume, What’s This Got to Do With Golf? You are going to make three plans for playing a round of golf on a course you know well. There is likely to be a map of the course on the scorecard. Make three blown-up copies of this map to twice its size on the scorecard. You can make marks on the maps to show where you would want to play the ball, and which clubs you would use. 1. On one map, make a plan to get onto every green in regulation. 2. On the second map, make a plan to stay in the fairway at all times, and out of rough, bunkers, trees, water, and what have you. 3. On the third map, make a plan to get on the green in one shot over regulation on every hole. No GIRs allowed! After you have done that, play one round with each plan, following it strictly. If someone were to bump you while you were swinging a golf club, that would throw off your swing and you’d hit a poor shot. You accomplish the same thing by putting tension anywhere in your body when you swing. Tension forces movements to go in unintended directions, or prevents certain movements from happening at all. The solution is to stay as relaxed as possible during the stroke. But just what does it mean to be relaxed? Many people think that relaxation is a limp, lifeless state. Nothing directed or powerful can come of that. There is another kind of relaxation, though, and it is more than the absence of tension. It comes from the mind and is the source of a person’s maximum speed and power in movement. How do you get it? Essentially, when the mind is feeling an infinitely rapid motion, it becomes relaxed and the body follows naturally. I go into great detail about this in my book, The Golfing Self. Once you have that feeling of infinitely rapid movement, swing the golf club, not at a ball, but just swing. Monitor your body and if you felt muscular force anywhere, then think “relax more” and swing again. Remember it is your mind that you are relaxing. If you still feel tension somewhere, think “relax more” and swing again. Pay attention to your hands. That is the first place we put tension into our swing, and the last place from where we remove it. Remember, we’re not lifting weights here. We’re swinging a golf club that weighs less than a pound. Keep going until any feeling of physical force and muscular tension has been eliminated from your swing. At this point, your muscles are moving freely and efficiently. The club will contact the ball with all the force and speed you can supply. Now go hit some balls with that swing and see what you think. Last year fifty-two posts were put up in this space, dedicated to helping you play better golf. Well, may be less than that, because of the major championship previews and a few editorials. But there was a lot. Ernie Els, You’re Not – swing the club at your tempo, not even Ernie’s. To Sink Putts, Practice Sinking Putts – the more putts you put in the hole, the easier you’ll think it is to do. Swing Through to the Finish – the swing is not over when you’ve hit the ball. Good Golf Takes Dedication – this means lots of practice. How Far Do You Hit Your Irons? – here’s a way to find out. Break-Even Putting – lag putting begins from a closer distance than you might think. Stop Chunking Chip Shots – it’s easy, once you know the secret. The Short Game in One Rule – a rule that will save you shots you didn’t realize you were losing. There’s enough material in there for a winter’s worth of work. Any one of them will cut a stroke or two off you score. What if you try all of them?